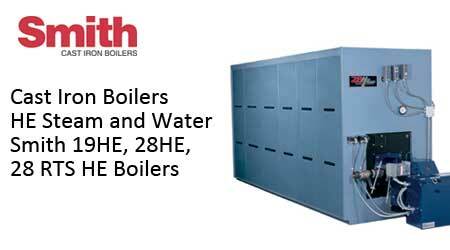 High Efficiency cast iron boilers from Smith. Smith is the only manufacturer offering a high-efficiency steam boiler. Efficiency makes replacement the smart choice. Smith provides long-term value and less hands-on operation and maintenance. The Smith 19 HE - ideal for light commercial with sizes ranging from 308MBH to 1750 MBH. 28HE and 28RTS HE - Simple install and maintenance - sectional design installs easily within exisiting mechanical rooms. Optimal Operation - Larger heat transfer surface and cast-in heat transfers pins allow for maximum thermal efficiency.